Saving money is a top priority no matter which industry your organization is a part. In the world of chemical usage and management, it may only come second to focus on safety. Chemical Safety Software addresses both matters as a critical concern. We place nearly as much emphasis in our system on reducing an organization’s expenditures through accurate and efficient inventory tracking and management as we do on workplace and facility safety. So to expand on our cost efficiency efforts, EMS now supports Chemical Usage Forecasting reports to empower our customers with the ability to use the aforementioned inventory tracking for cost saving in the future. As EMS tracks chemical usage, it is able to collate this information and build a forecast of chemical usage for a specified number upcoming of months. This will allow our customers to estimate chemical purchasing requirements and cut down on extra expenses and ultimately excess waste, in a literal and monetary way. The report uses tracked chemical usage recorded over a two-year span to formulate the chemical usage forecast. 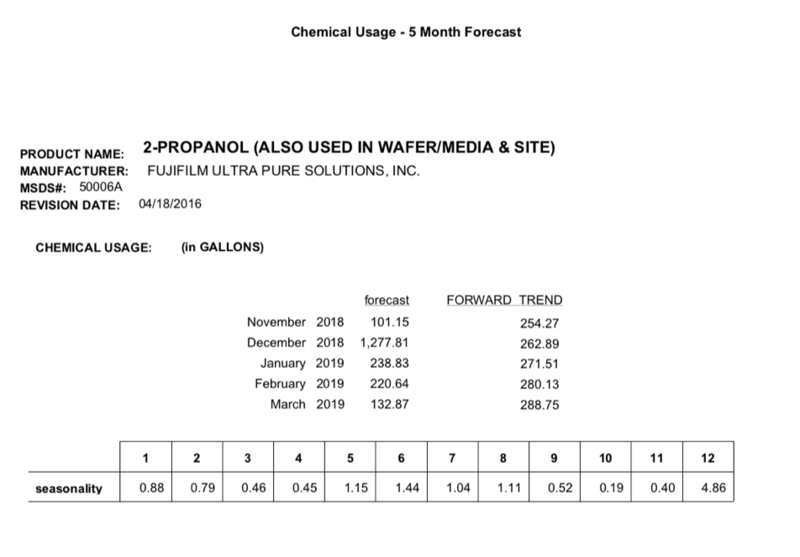 As see the report shows, the user sees the chemical forecast which is actuated according to the seasonality fluctuations and future trend.